Jessie is a charming and easy going lady. She can be shy at first but quickly warms to you. 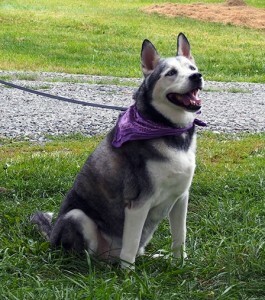 She is sweet, affectionate and loves to give gentle kisses. 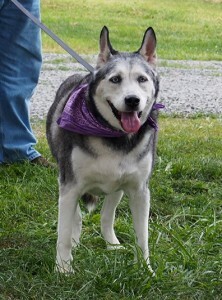 Jessie has an attentive gaze and is always looking for approval with her pretty blue eyes and sweet smile. 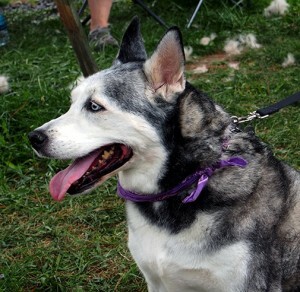 Unlike most huskies, Jessie is very laid back and doesn’t even pull on her leash. She likes to spend most of her time indoors getting attention, but really enjoys going for walks. She has some stiffness in her joints so long hikes or steep stairs would not be good for her. Jessie is not terribly food motivated which only adds to her sweet disposition. Jessie’s first home was with an elderly man who had to give her up when he was no longer able to care for her due to health reasons. She was a faithful companion to him and now needs someone to care for her. Could you be the wonderful family this sweet girl deserves?